Some end-of-the-workweek commuters got “oranged” from freeway overpasses north of Seattle on Friday by a large group of volunteers raising awareness of gun violence and advocating for more gun sense in our local communities, in Washington State and across the nation. Friday was National Gun Violence Awareness Day. 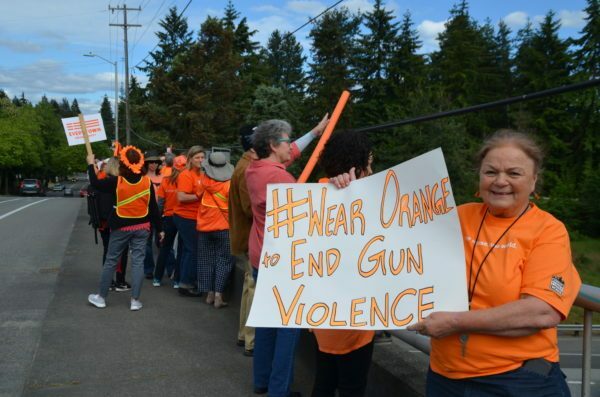 To mark the day and bring attention to the issue of gun violence, members of the local Shoreline group of Moms Demand Action for Gun Sense in America came up with the idea of gathering in all their #wearorange gear at the NE 185th Street overpass on I-5 for the afternoon / evening commute. The idea caught on with other local Moms Demand Action groups from Bothell / Mill Creek, Mountlake Terrace / Lynnwood and the Eastside, which held their own gatherings at multiple overpasses on I-5, as well as several overpasses on I-405 and Highway 522. “Awareness of the magnitude and impact of gun violence is critical if we are to come together in our communities and focus on ways in which we can save lives without compromising our Constitutional rights,” said Juliet Scarpa, lead for the all-volunteer Shoreline group of Moms Demand Action for Gun Sense in America. Wear Orange is a campaign that was initiated by friends of Hadiya Pendleton, who was shot and killed in Chicago at the age of 15, just a week after performing at President Obama’s second inaugural parade in 2013. Orange was the color Hadiya’s friends chose to honor her life and mourn that it was taken by gun violence. From that modest beginning, Wear Orange grew into a nationwide campaign. Additionally, in the wake of the school shooting in Parkland, FL, in February, school boards representing districts adjacent to Shoreline, including Seattle and Edmonds, have issued resolutions acknowledging the need for additional measures to prevent gun violence in our local schools and communities, and calling on our state lawmakers to pass legislation addressing the issue from both a policy and funding position. 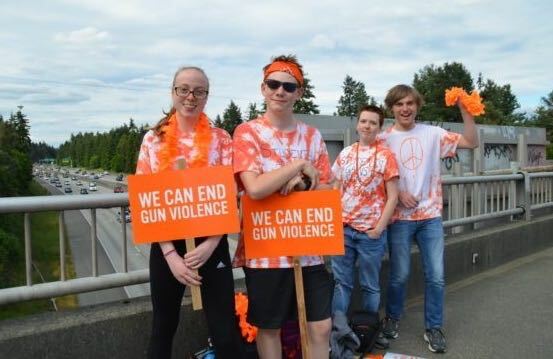 Students from Shorewood High School proudly wore their orange tie-dye shirts on the overpass at NE 185th Street to represent their school’s club, Students Against Gun Violence. Rowan Hurt started the club after the March 14 school walkout against gun violence. “It was formed to take action and make sure that students can do something, even though all of us can’t vote,” she said. Hurt said it means the world to students that the community would come together for an event like Orange the Overpass.